Nathan P. Gilmour , 28 June 2016. When Principles of Christian Theology turns its attention to creation, the book’s earlier distinctions between categories really start to bear fruit. Macquarrie’s earlier insistence that God does not name a being among beings but a sense that Being, that which lets-be, has a holiness to it, lets his account of things distinguish itself from older modes of creation-theology without making creation entirely a subjective thing. Since creation is not one being’s act that brings forth all the other beings (212) but a relationship between beings and Being, Macquarrie defuses the common critiques of the Genesis narratives that they assume impossibilities and thus narrate nonsense. To the contrary, by Macquarrie’s account (and following the demythologizing Bible-reading practices of Bultmann), Genesis’s creation stories are inherently existential, not cosmological (213), and the creation stories neither rely on scientific research for their theological power nor have anything to say to conversations about where and whether the universe began (216). I have to admit a bit of hesitation on that last point. There have been times when I’ve been inclined to regard scientific inquiry and theological teaching as non-overlapping magesteria, to let biologists and geologists do their thing while we Bible-readers did ours. But I’ve become more skeptical of that separation since then. I don’t have any inclination to return to the old days of “debunking” religious or evolutionary dogmas and expecting–foolishly–that people will have instantaneous conversion experiences as a result, but I’m not as sure as I used to be that the stories we science-lovers tell about the universe can drift about without any connection to other stories that we Bible-lovers tell. My sense is that a theology that dictates conclusions to scientific researchers is overreaching, but a theology that rules out any predicates about the created world is neglecting an important realm of intellectual experience. I’m still working through this, so Michial or any other readers should feel free to correct me on these things. Macquarrie does well to note that historical Christian theologies of creation focus almost exclusively on God the Father, neglecting to greater or lesser extents the rich tradition of the Son as creative agent in the New Testament (220). Macquarrie points to an excessive focus on Genesis as a possible reason for the imbalance; I’m inclined to point to the assignment of roles in the historic creeds, where the Father is always maker and creator and the Son is so busy being incarnated and crucified that there’s little time left for creating the world. But either way, Macquarrie does rightly call for Christian thinkers to re-claim the passages in Paul and John (but never Ringo) that assign creator-roles to the logos or to the Son. Because he’s a translator of Heidegger as well as a theologian, Macquarrie turns to Greek etymology to explore the character of the creative act itself: the Greek physis, often rendered as natura in Latin and then nature in English, has connotations of emergence or of becoming-as-part-of-being in other Greek literature (224). The implication here is that any category of beings sharing a physis (characteristics that make all of the entities in a category the same kind of beings) will also have the potential for some of them to emerge beyond, to take on greater degrees of complexity (224). Thus to say that animals are living-things but are among the more complex ones, and to say that human beings are animals but engage with the world in more complex manners than fish, does not insult plants or fish but simply reflects the doctrine that creation involves physis, the ongoing emergence of novelty and complexity in teh world (225). Among creations, human beings stand apart from other animals in that nature certainly shapes us, but to a far greater extent than other animals, we also shape nature (227). Macquarrie takes a weird turn in the closing run of the chapter, musing fro a while on why no machine will ever achieve real human intelligence (228–if a machine ever did such a thing, Macquarrie contends, that entity would effectively become Dasein and thus no longer a machine, which by its nature is equipmental) and digging into questions of angels and demons and why modern Protestants have such a time with both. He begins by speculating that, as liberal Protestantism became more activist in its core identity, entities like angels and demons stopped being as important–after all, they can’t be enlisted to alter social structures, and invoking demonic influence often shuts down calls for social justice (232). Yet, with a look along the lengthy history of Christianity, theology that contemplates has been part of Christian existence just as much as theology that organizes, so Macquarrie offers a well-received call to think hard about angels even in the face of such activist agendas. After a survey of historical and Biblical writings about angels, Macquarrie turns towards existential philosophy again and notes that angels, as traditionally conceived, are creaturely beings–they did not make the world–who, unlike humans, are not factical beings (228). In other words, the circumstances of their birth, their linguistic frameworks, and the finitude of a mortal creature simply are not part of angelic existence (which, now that I write that, likely is not existence as Heidegger would have it). Thus, even if modern liberal Protestants with an existentialist bent are less likely than other folks to talk to angels or to see fiery wings in the sky, the thought-experiments that emerge from thinking about angelic existence are useful precisely for contemplating human nature. The other side of the angelic, of course, is the demonic, and Macquarrie begins his discussion of angelic sin by noting that, whatever angelic sin might be, its severity is greater than human sin, given that they fall into sin without the buffers of facticity that make human existence so malleable (236). On the other hand, because Christian theology does not have a place for “evil” as an entity that exists, angels must by their definition be fallen creatures, and the “why” of their turn away from Being and towards the ultimacy of their own being must remain a matter of mystery and speculation, not dogma (238). 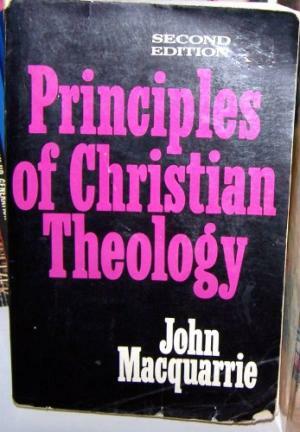 Principles of Christian Theology dedicates two chapters to creation theology, and the second begins with some of the possibility that the universe has purpose (240). Of course, as folks who have read around in David Hume know, there’s no sense in trying to prove the existence of God by pointing to signs of design in the universe: for that to be convincing, one would have to be able to compare the universe to something else, and all comparisons happen within the context of the universe. (One should note that the same argument does not hold as much force when one examines particular phenomena within the given universe.) But existentially–and that’s what we’re doing here–the urge to find order means something theologically, and the content of Biblical revelation often points to the universe as revealing, perhaps darkly, the designs of God (242). Two dangers arise when systematic theology gets ahold of providence though: for one, those who have been the beneficiaries of history always face the temptation of regarding themselves as specially chosen by God because history has gone one way or another. The corollary is worse, of course: those who have not drawn good cards in the birth-lottery must be specially disliked in the heavens. That sort of ideology comes up historically, but the stories of Egypt and Babylon and Rome dispel any simple equation of worldly prosperity and divine favoritism (let the Pharaoh Dave Ramsey take note). The harder knot to cut is fatalism, the notion that God’s knowledge is all-encompassing. My own students know this as the Boethius question, and its classical formulation happens in Consolation of Philosophy book five. The problem goes like this: if God knows exhaustively the content of every future moment, then even though you, reader, can’t be sure where you’ll be eight weeks and eight hours from this moment, God already knows whether or not you’ll murder the person who crosses your path at that moment. If God knows you will, then to refrain from that murder would be to render God’s knowledge wrong, and if you do, then the question arises whether you’re responsible, since God knows you will right now, even though you don’t know where you’ll be or who that person might be. Macquarrie turns not to Boethius but to Calvin to issue his critique, showing that the logical consequences of Calvin’s doctrine of divine knowledge (and, in Calvin’s case, direct divine causation) make human responsibility an utter absurdity (245). But things aren’t as easy as saying that Calvin painted himself into a corner: as Macquarrie shows, in a series of examinations, every metaphorical account of divine providence opens itself up to contradictions, overreaches, and other sorts of inadequacy (246). So Principles of Christian Theology ends up saying that providence is a confession, but whenever the devotional content of that confession falls to the temptation to explain, things necessarily go awry. Macquarrie’s section on miracles disappointed me. I’ll wait to see if Michial likewise left this section shaking his head, but approaches to these narratives that render them utter legend and perhaps even myth always strike me as Procrustean, and although I grant that not every demythologizer is Thomas Jefferson, I still want to make sure all my scissors are in drawers if these folks ever visit my house. But I should give an account of Macquarrie’s take on miracles. First, in order to function as miracles, they must stand apart from how the world normally operates (247). So far, so good. To his credit, he does not offer of a platitude like “everything is a miracle” or an account of miracles that are entirely in the observer’s experience. He also acknowledges that miracles are by definition distinct from scientific inquiry, which by definition looks for immanent causes when unexplained events happen (248–this is why, in the standard miracle-narrative that one sees in hour-long television episodes, the last plot event is almost always the revelation of some datum that explodes the most recent immanent-cause explanation and that, because of the restraints of episodic television, does not itself get investigated). But then the happy feelings end. Macquarrie asserts that Biblical miracle stories are likely some kernel of normal, explainable-in-terms-of-science experience, “embroidered by legends” (250), and eventually delivered to the faithful in the form of a written narrative. His example of such a narrative is the crossing of the Red Sea, which he accounts for as likely a moment when the winds were high and the tides were low, so pedestrian Israel could wade across, while the Egyptians’ chariot wheels likely got mired in the mud and left them unable to cross (251). The business about Moses’s staff and the water rising up like walls and the sea devouring the Egyptian army, for Macquarrie is so much embellishment that render a perfectly explainable event apparently miraculous (252-53). I’ve always been suspicious of natural-phenomenon explanations of miracles, whether they be the volcanic-ash account of the plague of darkness, the shared-resources explanation of the feeding of the five thousand, or the collective-hallucination account of the resurrection. I can understand some of the reasons people might have for doing that work, but I wonder whether levelling all things, so that there’s no remainder beyond the material operations of the forces of nature and the material operations of the interpreting brain, really does us any service or whether it makes us lazy, unable to imagine anything beyond what we already know. I’ll grant that real systemic cultural and political change could be genuinely divine work; I’d also like to think that our confidence in such possibilities resides at least in part with our collective memories that God has overcome other, seemingly insurmountable powers in the world, be those powers kingdoms or seas or death itself. But enough about that. I should talk a bit about evil. Once again returning to existentialist categories, Macquarrie calls evil those events in the world, willed by human beings or not, that destroy beings’ process of coming into line with Being (254). He borrows a formula later from Athanasius that makes a bit more sense of things, namely that evil is not nothing (which is morally neutral) but the moments of lapsing-into-nothing that the created world experiences (255). Evil can be natural or moral evil, with the distinction being the involvement of intelligent will. Natural evil involves sub-human phenomena like earthquakes and fire ants that cause human suffering. Macquarrie rightly notes both that the occurrence of natural evil indicates that divine existence involves the risk of harm done to the relationship between Being and beings and that explanations of natural evil, whether we make them acts of demonic war or of divine pedagogy, always come up with loose ends, meaning that any given articulation of natural evil’s place in a world is going to be provisional, not final (258). Turning to human sin, Macquarrie follows Calvin’s lead in designating idolatry as the root of all sins (260). In existential terms, all sin has in common that it regards some being rather than Being as ultimate, and the crimes that arise from such misdirected desires, though they are secondary to the attitude itself (261), nonetheless do harm because they aim away from good. The disposition of sinfulness does not often take the form of diabolical malice; more often sin simply leaves people following das Man (remember Heidegger?) and failing to live up to the potential of human existence. Sin’s relationship to creation is complicated. On one hand, because sin does not exist positively, God does not create it. On the other hand, because all intelligent creatures have the capacity to distinguish between Being and beings, and thus to turn one’s loyalty away from the former and towards the latter, the conditions for sin are always inherent in the creation of intelligent beings (264). I know I’ve been down on Macquarrie this post, but this formulation of divine involvement in evil strikes me as quite satisfying: it does not presume to narrate the “origin” of sin (just as Milton never really does in Paradise Lost) but acknowledges that, whatever sin might be, the potential was there, even if not the act. Macquarrie finishes with some comments on the escalating character of sin: although a narrative of sin might begin with a willed act, the force of the sin itself, as those acts compound, becomes something difficult if not impossible to resist (266). Thus original sin might indeed be insurmountable without gracious forgiveness, and emerging from sinful dispositions is never as simple as a single act of will. But such things do remain possible, in part at least because, for Macquarrie, original sin always comes along with original righteousness, a sense–even if a distorted sense–that living well with Being stands possible (267). As I often say about books that I value, so I’ll say here: Macquarrie is really good at getting me to dig into new questions, even when I don’t find his answers satisfying. At the end of these chapters I know I have to do something with miracles and science, that I’ve got to say something about sin and evil. And this book in particular reminds me that I’ve got to say something that makes sense in my own moment. Ultimately I’m more inclined to borrow philosophical resources from Wittgenstein than from Bultmann for talking about miracles, but I am more aware now that I need to do that work of borrowing.